WHAT DO YOU KNOW ABOUT ANTIOXIDANTS? Antioxidants are compounds that inhibit oxidation. Oxidation is a chemical reaction that can produce free radical, there by leading to damage the cells of organism. The source of these antioxidants are plant and animal based foods, but the body can itself make a few of these, too. Vitamins C and E, beta-carotene and the minerals flavanoids, phenols, plyphenols and phytoestrogens are also antioxidants. Each antioxidant works in a different way and together they team-up to fight free radicals. These chemicals cause the oxidation process that damages the cells and the genetic materials inside them. Free radicals are produced in the body when food is processed, gets sunlight, and gets affected by toxins like smoke, pollution and alcohol. 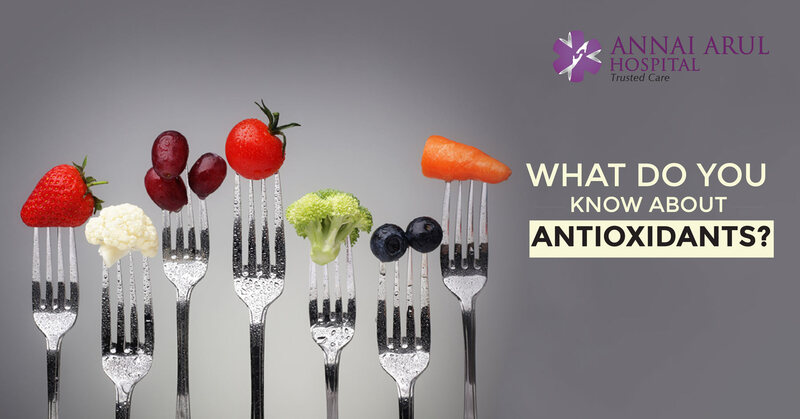 Antioxidants usually stop the free radicals in their tracks, which means they don’t allow the free radicals to form or just breaks them down, so they turn harmless. You can easily get antioxidants from your body itself. The food we eat is what gives us the majority of antioxidant supply. Vitamin E is obtained from whole grains, vegetable oils (olive, sunflower, canola), nuts, and green leafy vegetables. It is stored in fat and fights off free radicals that attack fats in the cell walls. It can also stop LDL cholesterol from turning thicker and harden the arteries leading to cardiovascular deisease. It is obtained from papaya, red bell pepper, broccoli, tomatoes, citrus fruits, it is best obtained in raw food because cooking can destroy the antioxidants in them. Vitamin C is also known as ascorbic acid and it is stored in water as it is water-soluble. It helps prevent cancers of stomach, lung and digestive system. You get this antioxidant from fruits, grains, coloured vegetables, spinach and other greens. It is also a fat-soluable carotenoid (giving colours to vegetables and fruits). The body turns it into retinol which helps in our eyesight. It is best when it is natural and not taken as a supplement. Lycopene is best obtained from cooked and processed tomatoes. Heating tomatoes makes it easier for your body to absorb the lycopene. A bit of fat like olive oil further helps the body use the nutrient well. They help protect against prostate, lung and breast cancer. It is plentiful in grains, onion, garlic, nuts, soybeans, seafood, meat and liver. They help in maintaining the thyroid and protects against cancer, especially of the lung, colon and prostate. Too much of selenium causes hair and nail loss and cirrhosis of the liver. Our body gets flavanoids from green tea, grapes, red wine, apples, chocolate and berries. Flavanoids are plenty in fruits and vegetables. Every plant has a different flavanoid. Flavanoids provide protection against heart disease, cancer, arthritis, aging, cataracts, memory loss, stroke, inflammation and infection. Omega 3 comes from salmon, tuna, sardine, flax seeds and walnuts whereas Omega 6 comes from vegetable oils, nuts and poultry. Omega 6 is required about four times to Omega 3 to obtain the balance. They help stop inflammation.